Guten Morgen Yuletide homeland! | Guten Morgen Berlin! January 2, 2014 January 11, 2015 - Guten Morgen Berlin! Mere days before the gentle rain and playful wintry breezes caused the entire transport system in the UK to implode catastrophically, I managed to get on a plane and come back to my home country for Christmas. It would be the first time coming home in almost eight months. More importantly, it would be my first decent cup of tea in what has felt like an interminable chasm of time. Three days of work in the London office of my (very important and internationally reknowned) company followed by a few comfy days in Berkshire; just enough time for me to rediscover a few of my country’s most beloved and festive cultural traditions. What are the chances that I would return from a long stint abroad and find myself squarely in the middle of Morris madness just days later? 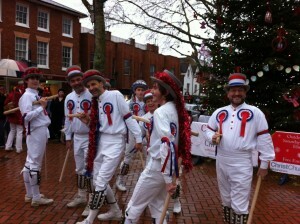 My international readers probably interpret Morris dancing as an inexplicable, confusing and almost violent outburst. That’s because it is. Morris dancing is a special English cultural dance performed, as illustrated in the photo, by a gang of sprightly people in white garb, covered in bells and ribbons and thwacking large sticks against themselves and others as they hop about the place. Generally, a Morris dance goes like this: dancers line up in pairs facing each other in the middle of an olde-worlde town square, village fête or country show; they skip towards each other; they then skip away from each other; they skip towards each other again; they skip away from each other a second time; they skip towards each other and this time they thwack their sticks together; they skip away from each other again. This process is repeated about five times to plonky folk music, then everyone stops and goes ‘Weyyyyyyyyyy’, and then the dancers take a brief rest before commencing a new dance which is supposedly different but essentially follows exactly the same steps as detailed previously. I began my return to the UK with a few days working in the London office. On the first day, during my lunchbreak., I went to a local café and bought a pot of soup, a fruit salad and a coffee and was taken aback when the woman at the till quoted me a price I would expect to pay for a wild night of drinking and dancing which would end with cigars and champagne on the rooftop of a foreign embassy at sunrise. I was late back for work, in fact, simply because I had to wait a while for my coffee to cool down before I could take a sip and spray it in astonished outrage. London, and the UK in general, is expensive. Ruinously so. We have mastered the art of charging close to three pounds for a cup of coffee which, every time I return to my homeland, seems to become greyer and more swamp-tasting with every increase in price. Dinner in a restaurant has gradually crept closer to the twenty-pound mark even for the most mundane chain-restaurant crud, let alone a plate of delicious something prepared by the chef in your local fancy gastropub. And the price of a single train ticket for a short journey or hop on the Tube costs so much that you wonder whether they are still using a steam engine and simply feeding your banknotes directly into the locomotive’s furnace as fuel. It’s no wonder dieting and minimalist décor are so fashionable at the moment; no-one can afford to buy proper amounts of food and furniture. Presumably this is also why people degrade themselves by wearing jeggings: real jeans are just too expensive at the moment (they’re probably taxed per trouser leg, too). In the build-up to Christmastime, I was invited to a carol concert by my mother, who is a member of the choir delivering said performance. As a fan of their singing and their camply jovial conductor/M.C., I enthusiastically accepted. I am not a tall person (some might use the term ‘stubby’) and so I chose a pew at the front so that I could see, because at the last concert I had to imagine the faces of the singers while studying the back of a balding man’s scalp. But as soon as I sat down, the people who had reserved the seats next to me arrived, and it became apparent that I had shoved myself right into the VIP section, ending up sitting next to the Mayor and his wife, and the local MP John Redwood with his Frau too. And thus it was that I found myself having to chat politely with the town Mayor for two hours, trying desperately not to stare at his enormous gold chain. “So…what’s it like…you know, being mayor…?” I’m genuinely ashamed that I could think of no better conversation than that after the first few moments of introduction. And evidently being mayor is staggeringly boring; from the sounds of things, all you do is wander from old folks’ home to hospital to hospice shaking the hands of sick or old people and, once a year, wishing them a very merry and somewhat poignant Christmas. “Gosh, I bet that involves going through a lot of mince pies!” I joked, and evidently the mayor and his wife were so grateful that I said something vaguely jokey as opposed to asking how heavy the chain is that they laughed heartily and we ended up having a rather pleasant chat about the geology of Iceland. That last fact is not a made-up piece of whimsy and just goes to show how well the British have mastered the art of Awkwardness. Where I come from, the act of ‘going to town’ is the exact opposite of the phrase people use when they want to jovially suggest that someone let loose and really have fun with something (painting one of the rooms of the house in eleven different colours or deciding to wax one’s entire body hairless, for example). In my home county, one ‘goes to town’ when there is quite literally nothing to do at home and the sheer boringness of everything cannot even be mitigated by reading the paper or annoying the cat. You might ‘go to town’ with your friends if they are in a similar situation in their home, or you might go with your family or partner. Either way, ‘going to town’ simply consists of an unnecessary trip to the nearest shopping area and wandering vaguely around the shops for a couple of hours pretending you are looking for a new pair of trousers, before you all eventually give up and admit that the real reason you are all here is to get a large flagon of coffee and a cake. Usually you come home with another newspaper and perhaps a DVD that was on sale or something, as material proof that there was a genuine purpose to this voyage into the local centre of trade. In one’s teenage years, ‘going to town’ often also involves a minimum of three hours spent pointlessly sitting in a cemetery or under some municipal stairs, hugging one’s knees and exchanging feeble innuendos. Although the Germans have the reputation for punctuality, Brits really excel at this ability to estimate perfectly the amount of extra time any given activity will require for Faffing. A trip to the gym? At least half an hour, once you factor in things like putting the wrong leg into the wrong hole of your gym shorts and being asked by a bloke in the car park if you have twenty pence. Grocery shopping? Could only be fifteen minutes, as long as you don’t realise when you first get into the car that you really ought to go back in and turn off your computer first. A family trip off visiting relatives several miles away? Here you won’t get away with anything less than the estimated Faffing time per person added together for the family unit and then squared to factor in the compound Faffing that occurs when multiple people faff together, thus creating new reasons for each person to begin a new Faff. Faffing is an inescapable part of life, and it’s an essential word once you know it, which is why my now-bilingual existence is so difficult at times. How can I express the concept to those who have never been able to put into words why you always end up leaving the house at least 15 minutes after having first put on your coat? How can I compete with people who have never acknowledged, perhaps never even known, what it is to faff? And how can I express my hatred of annoying and fiddly tasks without a German translation for the perfect phrase: “Ugh, it’s such a FAFF…”? ← Public service announcement: you are about to get publically SERVED, boy!